Colon cancer is the fourth most common cancer detected in the United States. In addition to being responsible for over 95,000 new cases annually, it has an increased incidence rate in patients younger than age 50, as per the Colon Cancer Alliance (CCA). The SW-620 tumorigenic epithelial cell line was derived by A. Leibovitz from a lymph node of a 51-year-old Caucasian male patient with colorectal adenocarcinoma and is a suitable transfection host. The SW-620 cell line expresses carcinoembryonic antigen (CEA), transforming growth factor alpha and matrilysin. Also, these cells are CSAp and colon antigen 3 negative, and positive for keratin by immunoperoxidase staining. According to a 1981 article in Cancer Research, SW-620 possesses many characteristics, making it an excellent in vitro and in vivo screening system for human colon adenocarcinoma. 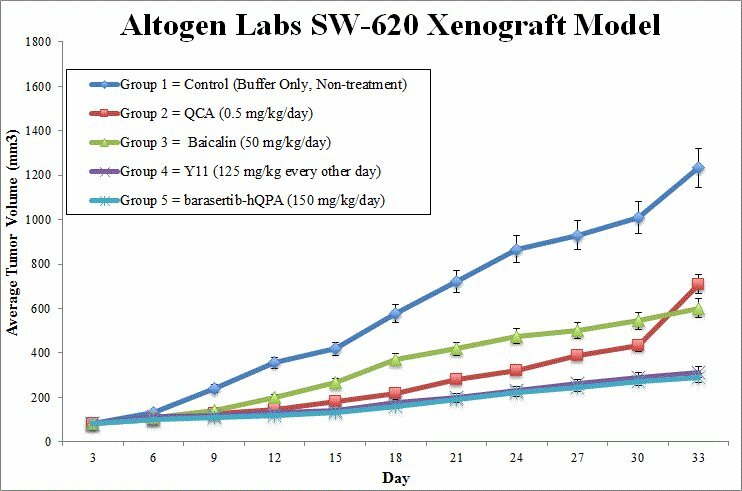 The SW-620 xenograft model itself could efficiently screen a variety of therapeutic agents against different types of human colorectal adenocarcinomas. This model is unique in that the SW-480 and SW-620 were established from primary and secondary tumors from a single patient, aforementioned, and so provides a unique research model opportunity. A 2001 study by Hewitt et al. highlighted the differences between the two SW- cell lines and concluded that SW-620 cells have a fibroblast-like appearance and xenografts form solid sheets and are more tumorigenic, metastatic and resistant to TNF-alpha and anti-Fas induced apoptosis as compared to its earlier stage SW480 counterpart, which is consistent with tumor progression. Another example of a study that used SW-620 cells is the 1981 study by Straggand et al. which was among the first to demonstrate the clinically relevant potential for screening anticancer agents using this model. They examined biological and cell kinetic properties of SW620 cells and reported that all xenografts are poorly differentiated, have extensive necrotic foci, minimal metastasis and grew at a similar rate to human cells’ kinetic profile. A more recent study published in 2012 by Ehrig et al. used the SW-620 xenograft to examine the efficacy of an oncolytic viral therapy using GLV-1h68, a replication competent vaccinia virus (VACV). They observed therapeutic effects in tumorigenic xenografts including increased survival, significant tumor growth inhibition, upregulation of immune-related antigens (including IP-10, INF-gamma, TNF-gamma, MCP-1, RANTES, MCP-3 and MCP-5) and increased infiltration of macrophages and NK cells in the tumors. These results ultimately support the potential of the VACV GLF-1h68 for colorectal cancer treatment. The SW-620 cell line is used to create the CDX (Cell Line Derived Xenograft) SW-620 xenograft mouse model. The SW-620 xenograft model is a clinically relevant model currently utilized for studying late stage oncolytic virotherapy or therapeutic effects on Rho GTPases (e.g. AZA197). SW-620 cells are continually maintained under the condition of exponential phase growth. Trypsinization cell viability counts are determined via trypan blue exclusion. Total cell suspension concentration is adjusted such that a 100 uL injection of the matrigel + SW620 suspension results in a total of 1 x 10^6 cells inoculated in the hing leg flank of each mouse (athymic BALB/c (Nu/Nu), 10 weeks). Injection sites are palpated up to tri-weekly. Upon tumor formation, measurements with digital calipers are made until tumors reach averages 50-150 mm3. Animal sorting is randomized and treatment cohorts are formed. Treatment with the compound of interest follows the dosing schedule. While on-study, tumors are calipered daily and body weights recorded. Animals are humanely euthanized as tumor size reaches the maximum size of 2,000 cu millimeters (or client size limit). Necropsies are performed and tissue collection is performed according to the pre-experiment setup. Each tumor is weighed and documented via imaging. Required tissues are snap frozen or stabilized in RNAlater, prepared for histology via 10% NBF or nucleic acids isolated.